(C) 2013 Ryan D. Spafford. This is an open access article distributed under the terms of the Creative Commons Attribution License 3.0 (CC-BY), which permits unrestricted use, distribution, and reproduction in any medium, provided the original author and source are credited. Invasive plants represent a significant financial burden for land managers and also have the potential to severely degrade ecosystems. Arthropods interact strongly with plants, relying on them for food, shelter, and as nurseries for their young. For these reasons, the impacts of plant invasions are likely strongly reflected by arthropod community dynamics including diversity and abundances. A systematic review was conducted to ascertain the state of the literature with respect to plant invaders and their associated arthropod communities. We found that the majority of studies did not biogeographically contrast arthropod community dynamics from both the home and away ranges and that studies were typically narrow in scope, focusing only on the herbivore feeding guild, rather than assessing two or more trophic levels. Importantly, relative arthropod richness was significantly reduced on invasive plant species. Phylogenetic differences between the invasive and local plant community as well as the plant functional group impact arthropod diversity patterns. A framework highlighting some interaction mechanisms between multiple arthropod trophic levels and native and invasive plants is discussed and future research directions relating to these interactions and the findings herein are proposed. Invasion is a worldwide epiphenomenon as a consequence of both significant dispersal and global change, and the environmental costs are staggering (Mack et al. 2000; Pimentel et al. 2000; Pimentel et al. 2005; Colautti et al. 2006). Several hypotheses have been proposed to explain the success of invasive species typically highlighting a novel characteristic of the invader or a relative deficiency in a novel habitat that renders it susceptible to invasion (Catford et al. 2009). One of the most widely invoked explanations for the success of invasive plants is the enemy release or escape-from-enemies hypothesis (hereafter referred to as the enemy release hypothesis, ERH) that posits that natural enemies (e.g. pathogens and herbivorous arthropods) do not follow invaders from their native range into their introduced range and thus are not able to suppress their expansion (Elton 1958; Crawley 1987; Maron and Vilà 2001; Keane and Crawley 2002; Wolfe 2002). Consequently, invasive species may achieve pronounced vigour and growth in their introduced ranges (Baker 1974; Noble 1989; Blossey and Notzold 1995; but see Vilà et al. 2005) or more importantly relative numerical dominance (Barney and DiTomaso 2008; Siemann and Rogers 2006). The key assumptions of the ERH are that (1) herbivores are capable of regulating plant populations; (2) specialist herbivores endemic to the invasive species are not present in the introduced range; (3) host-switching of specialist herbivores from native congeners is rare; and (4) native plant species experience greater pressure from generalist herbivores than do invasive species (Keane and Crawley 2002; Cripps et al. 2006). Insects are assumed to be the dominant herbivores associated with invasive plants (McEvoy and Coombs 1999; McEvoy 2002). The ecological research on native herbivore effects on invasive plants is equivocal depending on the herbivore species, plant taxa, and spatial and temporal context (Southwood 1961; Proches et al. 2008; Rohacova and Drozd 2009; Schooler et al. 2009; Fork 2010). For instance, Agrawal et al. (2005) paired 15 exotic plant species with 15 native con-familials in a common garden and allowed native arthropod fauna to colonize the plots over several years. Overall, their results indicated that there was less herbivore damage on exotic species, but this did not correlate with different patterns of herbivore richness or net abundances on native versus exotic plant species. In a similar experiment, Zuefle et al. (2008) paired 15 native plant species with 15 non-native congeners and 15 non-native species lacking congeners in the United States (termed “aliens”), and the authors allowed native arthropod fauna to colonize the plants over two years. Herbivore biomass was greater on natives than non-native congeners and aliens, but biomass did not consistently differ between congeneric pairs of plants. Additionally, aliens retained more biomass than non-native congeners but there was no difference in herbivore species richness or the number of specialist and generalist species collected among the three plant groupings in either year. Other studies have found that invasive plants experience reduced herbivory, lower herbivore species richness estimates, and little if any attack from specialist herbivore species in comparison to native plants (Costello et al. 2003; Cuda et al. 2007; Rohacva et al. 2009; Ando et al. 2010; Lieurance and Cipollini 2012). A meta-analysis conducted by Liu and Stiling (2006) provided evidence that insect herbivore fauna richness is significantly greater in the native than introduced ranges of invasive plants, and this reduction is skewed towards specialists and insects feeding on reproductive parts. Herbivore damage levels were also found to be greater on native plants than on introduced invasive congeners, however, herbivore damage levels were only marginally greater for plants in native than in introduced ranges. Direct control of some invasive plant species by arthropod herbivores is thus plausible (e.g. singular control by biological control agents, see Myers 1985), but fluctuations in herbivore pressure do not necessarily translate into meaningful differences in invasive plant performance (Hierro et al. 2005; Liu and Stiling 2006), an important assumption of the ERH. Nonetheless, the community dynamics of arthropod-plant interactions are generally overlooked as we have focused primarily on target feeding guilds (i.e. herbivores) and not on local arthropod communities within an invaded site or region. The role of arthropod diversity at the community level is thus largely unexplored and likely a very important avenue of future invasion research. We propose that a powerful evaluation of plant invasion processes can be achieved by documenting whole arthropod community dynamics (e.g. richness, diversity, interactions) in the native and introduced range of a plant invader. Biogeographically contrasting invasion dynamics is rarely practiced (Hierro et al. 2005), either because differences between ranges are assumed to exist a priori and are therefore deemed unimportant, or because comparative studies across continents can be prohibitively expensive (Hinz and Schwarzlaender 2004). Further, studies that do contrast invasion dynamics biogeographically are typically limited to plant-plant interactions without quantifying the arthropods that may significantly moderate the plant invasions directly or indirectly. Therefore, studies that document invasive plants in both their native and introduced ranges and include measurement of more than one arthropod feeding guild (i.e. predators, parasitoids, detritivores, etc.) could provide a more comprehensive understanding of plant invasions than those documenting only herbivores on select target plants in one place. Plant-plant and plant-arthropod interactions are complex, and the capacity for herbivorous arthropods to induce damage is mediated by both higher and lower trophic levels limiting their abundance, diversity, presence, or feeding behaviour (Hairston et al. 1960; Bernays 1998; Schmitz 1998). Further, predator and parasitoid efficacy is mediated by plant architecture (e.g. shrubs vs. grasses vs. trees), volatile cues, and dynamically fluctuates in response to prey and competitor abundance (Price et al. 1980; Pearson 2010). Detritivore abundances may be enhanced by plant invasions when microclimates are favourably altered (e.g. increased moisture or inputs of food matter), or when predator efficacy is reduced. A conceptual framework for potential interactions in native/invasive plant-arthropod systems illustrates the complexity of whole food-web interactions (Figure 1A) and the uncertainty introduced when only herbivores are targeted in plant invasion studies (Figure 1B). Herbivores, predators, parasitoids, and detritivores are all linked strongly to native and invasive plant community complexes (boxes embedded within concentric native/invasive plant circles). Reciprocal interactions between arthropod feeding guilds are denoted by solid lines and encompass predation, parasitisation, and intra- and interspecies competition. The influence of these interactions becomes lost (i.e. dashed lines in Figure 1B) when arthropod-plant interactions are limited in scope to enumeration of only the herbivorous feeding guild. A conceptual framework of potential interactions in native/invasive plant-arthropod systems. 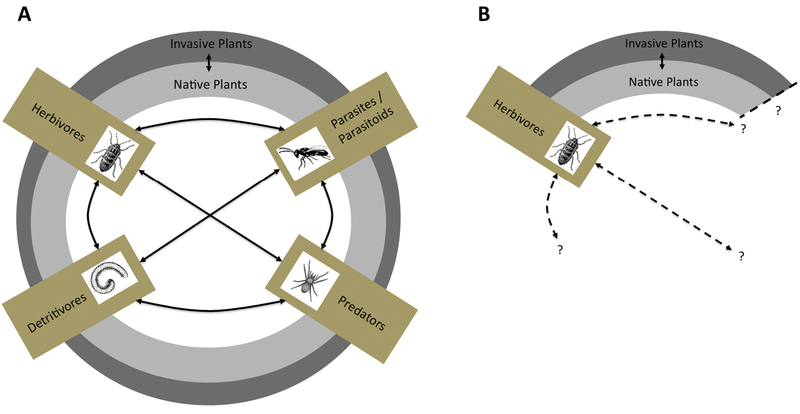 Herbivores, predators, parasitoids, and detritivores are all linked to native and invasive plant community complexes (boxes embedded within concentric native/invasive plant circles). Solid lines denote reciprocal interactions between arthropod feeding guilds B Dashed lines denote the uncertainty introduced when only herbivores are targeted in plant invasion studies. The influence of multi-trophic interactions becomes lost when studies of plant-arthropod systems are limited in scope to only the herbivorous feeding guild. The purpose of this systematic review was to quantify the state of knowledge of arthropod community dynamics in the context of plant invasion, in order to examine the general hypothesis that a biogeographical and multi-trophic examination of arthropod communities enhances evaluations of plant invasions. Specifically, we explored whether: (1) biogeographical contrasts of the arthropod communities associated with invasive plants are under-utilized in the invasion biology literature; (2) arthropod sampling is biased to the herbivore feeding guild and largely ignores the arthropod community as a whole; (3) relative richness of arthropods associated with invasive plants is lower than commonly found on native plants; and (4) phylogenetic differences between the invasive plant and the local plant community and the plant functional group of the invader have the capacity to impact arthropod diversity. Exploration of the literature via quantitative systematic review provides a broad assessment of the importance of local arthropod communities as an indicator or even predictor of invasive plant species dynamics, and studies documenting the dynamics of entire arthropod communities are a logical step in future evaluations of plant invasions. A systematic review of the literature using the Web of Science was conducted in September 2011 using following keywords: “invas* plant* (insect OR arthropod OR herbivor* OR natural OR phytophag*) and (diversit* OR abundance OR richness OR herbivory OR removal OR enem*)”. A total of 1746 studies were retrieved. However, studies were retained for this review only if they explicitly included arthropods, i.e., studies on mammals were excluded. Aquatic systems and secondary studies not based on experimental data directly collected by the authors (i.e. review or idea articles) were also excluded. Finally, all references cited within these articles were also inspected and included to further extend scope. A total of 53 relevant articles published in 31 different journals were selected for inclusion in this review. The first study was published in 1982, and only three studies were published prior to 2000. The majority of studies (38%) were published in 2009 and 2010. These articles have been cited a total of 759 times as of December 2011. The number of citations/article ranged from 0 to 104 (0 to 14.86 citations/year; mean = 2.23), with most articles (70%) being cited less than 10 times, indicating that perhaps literature corresponding to arthropod community dynamics on invasive plants is not highly visible. Journals contributing the highest number of articles were Biological Invasions (17%), Biological Conservation (9%), and Environmental Entomology (7%). To characterize the literature on native arthropod communities associated with non-native plant invasions, the following parameters of each study were recorded: ecosystem type (e.g. grassland, experimental field, waste area); the country in which it took place and whether or not it was biogeographical (i.e. data on arthropod communities in association with the invasive recorded in more than one region); native plant species community richness; invasive plant species taxonomy; the plant functional group (PFG) of each invader (tree, shrub, graminoid, or herb); native arthropod community characteristics on invasive host plants/within invaded habitats (i.e. 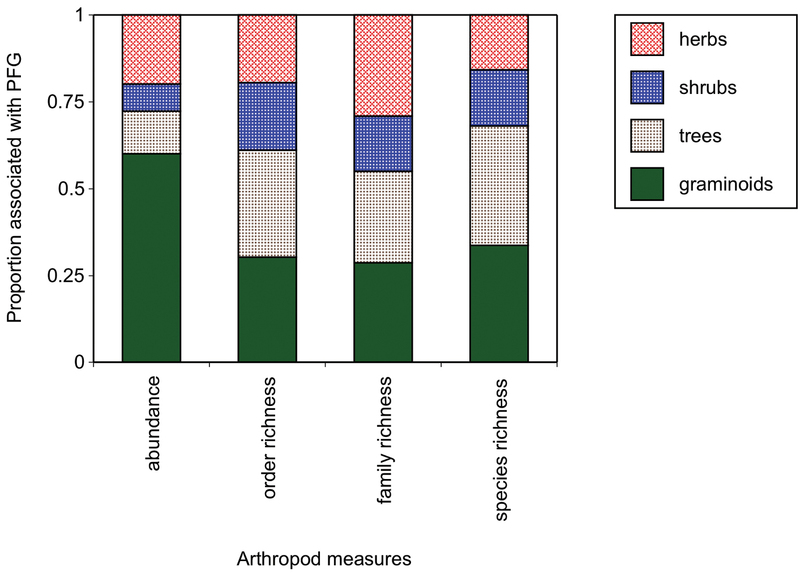 abundance, order, family, and species level richness) and; the class and number of arthropod trophic levels examined (i.e. herbivores, predators, detritivores). Studies were permitted more than one database entry if they examined more than one non-native plant species or geographic region. As this study is strictly a systematic review and not a meta-analysis, effect sizes were not calculated. Descriptive statistics were used to explore the first two broad patterns associated with the literature including Chi-square tests for differences in relative proportion of studies where appropriate. Generalized linear models (GLMs) were used to explore the latter two patterns that diversity of arthropods is affected by native versus invasive plants and then by PFG and phylogenetic measures of these plants (firstly, we used the entire dataset and then did a second more direct test via paired t-tests of only the studies that used coupled contrasts). Alpha was set at p < 0.05, and post hoc contrasts were applied when significant to identify specific differences if more than two levels (Nonparametric Wilcoxon signed-rank tests were used as highly conservative between-level tests). Studies were included in these analyses if more than a single trophic group was examined, arthropod richness estimates were provided, and contrasts between target (i.e. on the invasive plant) and native plants or within the community were reported in some form. A total of 4 studies reported only order-level arthropod richness whilst all others reported species-level estimates. The order-level values fell within one standard error of the mean of species-levels estimates so were not excluded. The log response ratio (LRR) was also calculated to summarize the strength of the relative difference between arthropods associated with native versus invasive plants (Hedges et al. 1999) within each study (using only the studies that used a target invasive-native paired plant design directly). Finally, phylogenetic relationships among all 1045 plant species reported were constructed by grafting published phylogenies onto a family-level backbone based on the APG3 derived megatree produced with Phylomatic (Webb and Donoghue 2005). Polytomies were present below the family level and were resolved from published clade-specific phylogenies to the genus level (see Supplementary File 1 for references and Supplementary File 2 for the Newick file). Polytomies among species within genera were randomly broken as species-level phylogenetic information was rarely available or consistent across studies. The lack of resolution at terminal nodes is likely to make subsequent tests more conservative (Swenson 2009). Dated nodes from Wikstrom et al. (2001) and TimeTree (Hedges et al. 2006) were used to restrict branch-lengths based on estimated divergence dates with undated descendant nodes evenly spaced using the bladj algorithm in Phylocom (Webb et al. 2008). Within a study, the mean and maximum phylogenetic distance was calculated between the invader and all other species within the community. Regression analyses were used to test whether these two phylogenetic measures impact arthropod richness. All statistics were performed with JMP 9 ver. 9.0.2 (SAS). From the 53 studies included in this review 11 ecosystem types were censused for arthropods. In decreasing order of prevalence these were: grassland, mixed, forest, experimental field, marsh/wetland, shrubland, riparian, waste area, desert, dune, and floodplain ecosystems. Two studies did not detail the ecosystem from which data was collected. Geographically, arthropod communities were censused in 27 countries (Figure 2). Fifty three percent of all studies were conducted in North America, while 28% were conducted in Europe (Figure 2). Less than 8% of all studies (4/53) used biogeographical contrasts to record arthropod dynamics in the native and introduced ranges of invasive plant species. A world map illustrating the geographic distribution of arthropod-invasive plant studies from the literature in this review. Darker coloured icons represent greater relative arthropod richness. A total of 38% of studies measured only one trophic level whilst 30% of studies evaluated 4 trophic levels. Fewer studies evaluated only two or three trophic levels (Figure 3, 11% and 21%, respectively). These proportionate differences were significantly different (Chi-square, c2 = 8, p = 0.039, n = 53). A breakdown of studies based on which feeding guilds were examined indicated that the majority (92%) targeted at least herbivorous arthropods. Predators were measured in 64% of the studies, detritivores in 53%, and parasites/parasitoids in 34% (Figure 4, Chi-square, c2 = 16, p = 0.0013, n = 129). Proportion of all 53 studies in this review examining either 1, 2, 3, or 4 trophic levels. 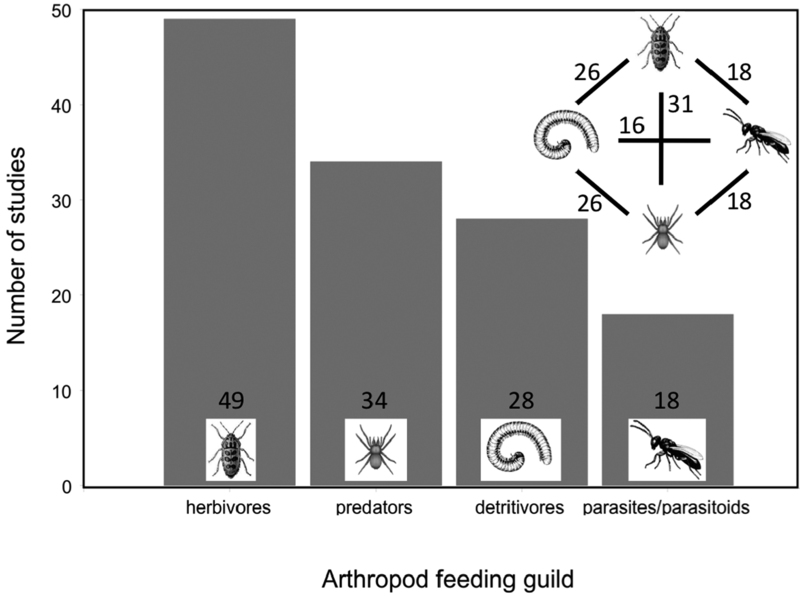 Number of all 53 studies in this review examining each of the arthropod feeding guilds. Arthropod richness estimates associated with invasive plants were significantly depressed relative to native plants or monoculture/community estimates using all cases (Figure 5, GLM, chi-square = 385, p = <0.0001, n = 124). Using only paired contrasts within studies, the strength of the relative depression in arthropod richness between invasive and native plants was -0.18 +/- 0.06 (mean LRR with s.e. ), and this estimate was significantly different from a null of 0, i.e. no difference (t-test for mean diff from 0, t = -2.5, p= 0.01, n = 62 cases). The diversity of arthropods associated with native and invasive plant species. 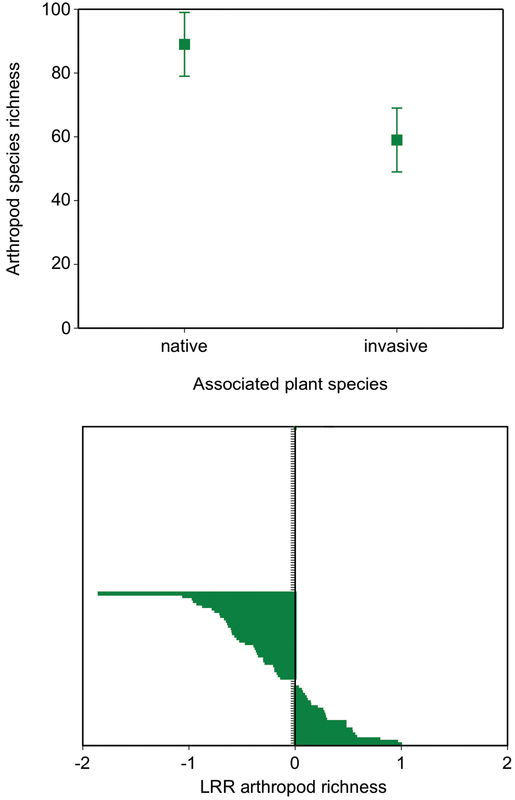 The top plot shows the mean number of arthropod species reported on invasive target plants and the native community +/- 1 s.e. for all studies. The lower modified Forest plot shows the log response ratio (LRR) for only studies that used direct paired contrasts between an invasive and target plant species (n = 62 cases, see text for details). Negative values denote a relative reduction in arthropod species richness on invasives relative to native plants. 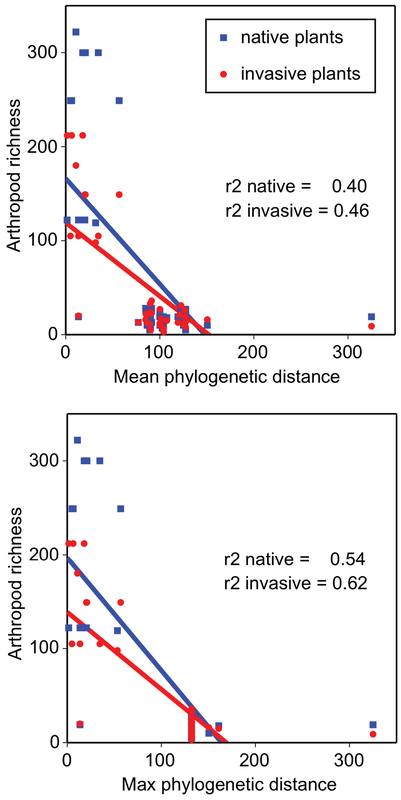 Both mean and maximum phylogenetic distances significantly predicted arthropod richness on invasive and on native plants (Figure 6, Regression analyses, all p < 0.0001, r2 values listed on plots). Increasing phylogenetic distances reduced arthropod diversity (Figure 6). Plant functional group significantly influenced arthropod richness at the species level (GLM, Chi-square = 33.8, p = 0.001, df = 1) but only for arthropods associated with invasive plant hosts - not native plants (GLM, Chi-square PFG*host= 80.3, p = 0.0001, df = 3 with Wilcoxon post hoc paired contrasts, p > 0.05 for all natives). Specifically, arthropod species richness differed between invasive trees and herbs (Figure 7, Wilcoxon paired contrasts, p = 0.02), and the abundance of arthropods associated with invasive trees differed from graminoids (Wilcoxon paired contrast, p = 0.05). Given the exploratory nature of this review, corrections for multiple comparisons were not made (Rothman 1990; Saville 1990), and importantly, inflated type I error is controlled by the overarching GLMs used to determine which pair-wise comparisons to make. In a strict two-way comparison, PFG for woody plants significantly influenced arthropod richness at the species level (Wilcoxon rank sum test, Z=2.27, p = 0.023). Specifically, arthropod species richness differed between invasive trees and shrubs (Figure 7). The effect of mean and maximum phylogenetic distance estimates on arthropod species richness on invasive and native plants. Linear regressions are shown (p < 0.0001). The relative arthropod order richness, family richness, species richness, and abundance across PFG on invasive plant hosts. For simplification, relative proportions are plotted instead of raw data as values ranged widely. The primary objective of this systematic review was to quantify the state of knowledge of arthropod community dynamics in the context of plant invasion. Results of this review highlight some key trends in the arthropod-invasive plant literature: few studies adopt a biogeographical approach when contrasting arthropod communities associated with invasive plants in both native and invasive ranges. Sampling is also relatively simple, primarily documenting only the herbivore feeding guild and not the arthropod community as a whole. The relative richness of arthropods associated with invasive plants is lower than commonly found on native plants suggesting direct or indirect depressions of arthropods. Finally, phylogeny and plant functional grouping can be important factors influencing these reductions in diversity. Arthropod communities clearly respond differently to invasive plants than to native plants. Studying invasive species from a biogeographical perspective is a powerful yet underappreciated tool in invasion ecology (Hierro et al. 2005). At different spatial scales, biogeographical contrasts can provide a direct way to infer the overall extent of invasion as well as to directly compare community dynamics between ranges. For instance, Lamarque et al. (2012) contrasted two congeneric maple species (density, relative abundance, age structure, effects on native species) between France and Canada locally and regionally and demonstrated that density is a viable and useful proxy for invasibility. A study from this review by Cripps et al. (2006) contrasted herbivore community dynamics (diversity, evenness, richness, host utilization) on Lepidium draba in its native, expanded, and invasive range effectively testing whether biotic restraint can be mediated through biogeography (it was). However, studies such as these remain scarce in the literature probably due to high financial costs and logistical constraints when sampling in both regions. Regardless, wider scales in sampling of arthropods will dramatically improve our understanding of the full community consequences of invasion. Sampling regimes focusing on only the herbivore feeding guild comprise a large proportion of the literature (e.g. two of the four biogeographic contrasts in this review). While informative, these studies are not adequate to fully explain the mechanisms by which plant invaders are successful and may introduce uncertainty and thus false conclusions regarding observed declines in herbivores within invaded regions (i.e. Figure 1B). Herbivore declines are often attributed directly to invasive plants but they may be the product of an indirect interaction whereby an invader facilitates predacious or parasitoid species that in turn depress herbivore communities. Specialized enemies such as parasitoids use both visual and volatile cues from plant hosts and their prey items when hunting. In invaded habitats novel plants may initially mask prey presence, although novel cues can be learned after successful foraging (Vet and Dicke 1992). Pearson (2009) found that native spiders were enhanced in grasslands invaded by Centaurea maculosa due to altered vegetation architecture for building webs, whereby formerly simple vegetation was replaced by more complex stands. This resulted in a substantial increase in invertebrate predation rates. Similarly, female condition and reproductive output of the endangered wandering spider Arctosa fulvolineata were enhanced in salt marsh habitats invaded by Elymus athericus (Pétillion 2005; 2009). These positive effects were attributed to a more complex litter layer in invaded habitats compared to uninvaded ones and food limitation was not considered a factor (Pétillion 2005). In other instances where invaders have altered litter inputs within novel habitats, micro and macrodetritivores have responded both positively and negatively to changes in detritus microclimates and food resources (Gratton and Denno 2005; Mayer et al. 2005; Kappes et al. 2007; Wolkovich et al. 2009). Within invaded systems, how shifts in detritivore communities influence predacious or parasitic arthropods, and in turn, how changes in consumer guilds may impact arthropod herbivores is not well understood. Whilst it is intuitive and convenient to limit arthropod studies to herbivores, it would be imprudent to regard invaded systems so simplistically because plant-herbivore interactions have evolved through selection pressures acting in both bottom-up and top-down directions (Hairston et al. 1960; Price et al. 1980; Bernays and Graham 1988; Agrawal 2000; Dicke 2000). Predators and parasitoids have tremendous potential to mold arthropods community structure in the context of plant architecture. In general, plants with greater architectural complexity (e.g. shrubs vs. grasses) provide more places for arthropods to hide from natural enemies (Lawton 1983). arthropods can gain spatially mediated “enemy-free space” on architecturally complex plants by modifying their distribution or behaviour in a way that eliminates or reduces their vulnerability to natural enemies (Jeffries and Lawton 1984). For example, the polyphagous tansy leaf beetle Galeruca tanaceti is hypothesized to gain spatial enemy-free space by ovipositing in structurally diverse habitats over simpler ones, which reduced the searching efficiency of its specialized egg parasitoid (Meiners and Obermaier 2004). Conversely, plants can also provide shelter and alternative food to predators, resulting in depauperate herbivore communities in the presence of predators (Dicke 2000). Phylogenetic tools are rapidly being applied to the study of plant interactions, community dynamics, and invasion. Phylogenetic similarity between host plants can be associated with similarity in herbivory levels (Hill and Kotanen 2009; Ness et al. 2011), mutualistic interactions (Rezende et al. 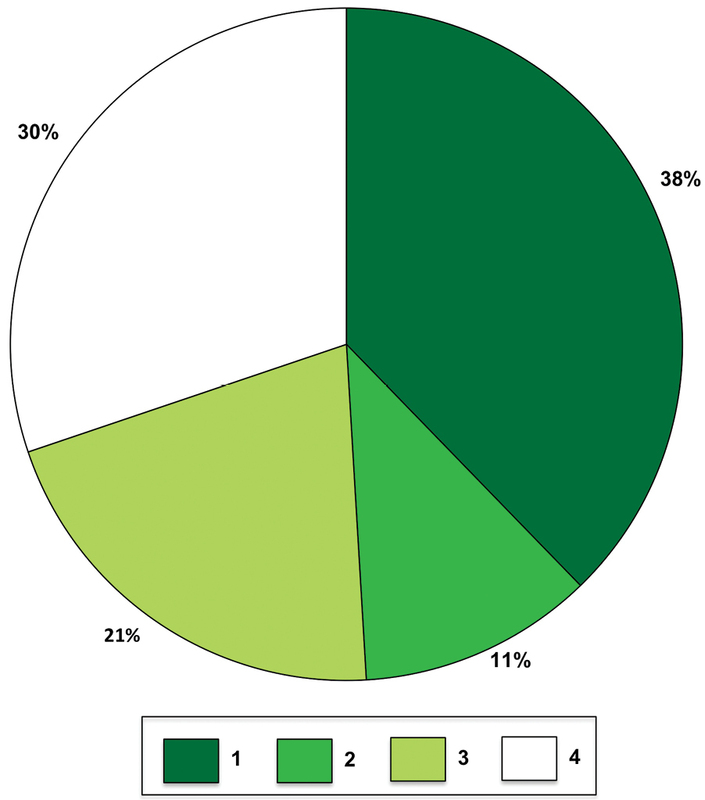 2007), and overall arthropod community composition (Weiblen et al. 2006). The link between phylogenetic and ecological similarity can be attributed to the high degree of phylogenetic conservatism in relevant traits (Wiens et al. 2010); invasive plant species may often be both phylogenetically (Gerhold et al. 2011) and functionally (Godoy et al. 2011) unique from the invaded native community. We propose, and show for the first time, that these tools can be an effective means to infer or even predict relative impact on arthropods communities by novel plant species. We must point out however that this approach was tested via a systematic review using data compiled across studies and not from single, controlled experiments. Nonetheless, this broad test showed a clear correlation between phylogenetic distance estimates and richness. Diversity is an important response variable in ecology, a major ecosystem service, and sometimes a predictor of relative sensitivity to perturbation at larger scales. Plant invasions in general have been shown to reduce diversity of native plant species (Alvarez and Cushman 2002; Flory and Clay 2010). The impact of plant invasions on arthropods is predicted to also negatively impact diversity (Simao et al. 2010), and this finding was confirmed here in the first thorough systematic review of the topic. In general, more complex and productive habitats increase arthropod species richness - particularly that of herbivores (Murdoch et al. 1972; Root 1973; Allan et al. 1975; Siemann et al. 1998; Agrawal et al. 2006; de Groot et al. 2007; Simao et al. 2010). Aggressive plant invaders thus have the potential to drastically alter native plant communities both directly through plant competition with natives and indirectly through introduction of poor host plant material for native arthropods (Lau and Strauss 2005). The most parsimonious explanation for the depressed diversity detected here is the lack of suitable host plants. Nonetheless, it is also reasonable to extend this implication to much larger ripples including eventual collapse of arthropod communities through reduced trophic complexity or even melt-downs and additional invasions with less potential arthropods controls persisting within regions. Arthropod diversity must be incorporated into the study of plant invasion so as to effectively assess impact and resilience more broadly. Like most correlative approaches however, it is difficult to infer cause and effect or decouple drivers from passengers in the invasion literature (MacDougall and Turkington 2005). Consequently, it is important to note that whilst documentation of background arthropod community patterns in plant invasion studies effectively enhances our capacity to infer larger scale impacts of invasion, delineation of mechanism and tests of top-down control should also be nested within studies of arthropod community dynamics. 1	Integrate a biogeographic contrast of invasion with even a coarse but robust community arthropod sampling regime to comprehensively assess the mechanisms surrounding plant invasions. This might entail documenting at least the proportion of predators vs. prey items, and if possible the specific feeding mode of each arthropod (e.g. specialist or generalist), to clarify the direction and mechanism by which herbivore controls are acting on invasive plants similar to what has been detailed in food web studies (Schmitz and Suttle 2001; Henry et al. 2010). 2	Consider the role of plant functional group and by extension the complexity (or simplicity) of the native and exotic vegetation, and how this may mediate arthropod community interactions at all trophic levels (i.e. enemy-free space; resources available to arthropods). An extension of this concept could involve plant functional groups as they relate to plant primary and secondary defense compounds against herbivores, and the role this might play in trophic interactions. 3	Contrast the phylogenetic distances of invaders vs. native species where possible to elucidate mechanisms by which arthropod communities interact, both arthropod-arthropod and arthropod-plant. An invader that shares relatives (i.e. same family or genus) in a receiving community might be more amenable to hosting native arthropods by nature of similar morphology and chemistry than phylogenetically distinct invaders. We thank N. Yan and R. Callaway for direction and helpful comments. The thorough and constructive feedback from two anonymous reviewers is highly appreciated. A Natural Sciences and Engineering Research Council of Canada’s Discovery Grant to CJL and Funding provided by York University to RDS supported this research. This is publication #72 of NSERC-CANPOLIN. Elton CS (1958) The ecology of invasions by animals and plants. Methuen (London): 1–196. Myers JH (1985) How many insects are species are necessary for successful biological control of weeds? In: Delfosse ES (Ed). Proceedings of the VI International Symposium on the Biological Control of Weeds August 13–25, 1984. Agriculture Canada (Ottawa): 19-25. Noble IR (1989) Attributes of invaders and the invading process: terrestrial and vascular plants. In: Drake JA, Mooney HA, di Castri F, Groves RH, Kruger FJ, Rejmanek M, Williamson M (Eds). Biological Invasions: A Global Perspective. John Wiley and Sons Ltd. (Chichester): 301-313. Saville DJ (1990) Multiple comparison procedures: The practical solution. The American Statistician 44 (2): 174-180. List of family-level phylogenies used to construct the master phylogeny. (doi: 10.3897/neobiota.16.4190.app1) File format: Micrisoft Word Document (docx). Phylogenetic tree contrasting invasive and native plant species. (doi: 10.3897/neobiota.16.4190.app2) File format: Tree Files (tre).